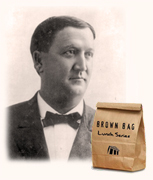 Today at noon, the Old State House will host another of its Brown Bag Lunch Lectures. This one is entitled Jeff Davis, Alcohol, and the Second Baptist Church Controversy of 1902. In 1902, Arkansas’ notoriously divisive Governor Jeff Davis was spotted publicly drinking alcohol aboard a train. A firestorm of controversy resulted within the Second Baptist Church of Little Rock and Davis was thrown out of the congregation. This lecture will reveal the roots of the controversy in an earlier fight over building the new state capitol building between Davis and former Governor James Eagle, chair of the deacons of the church. Brian Irby is a library tech at the Arkansas History Commission. He received his B.A. and M.A. in history at the University of Central Arkansas. This entry was posted in History, Lecture and tagged Arkansas History Commission, Gov. James Eagle, Gov. Jeff Davis, Old State House Museum, Second Baptist Church by Scott. Bookmark the permalink.